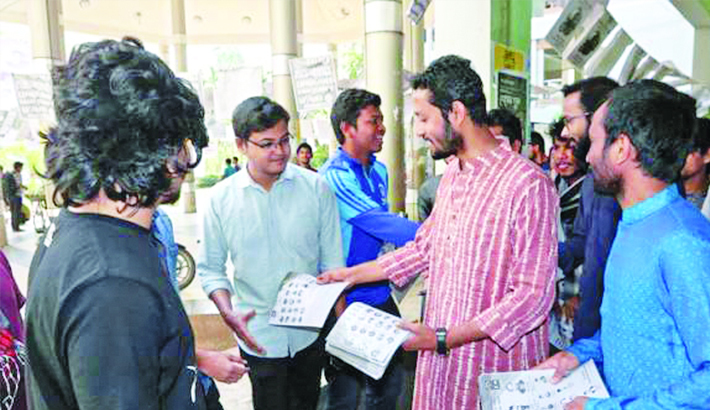 The hectic campaign which continued over the last two weeks for Dhaka University Central Student’s Union (DUCSU) and hall unions’ elections now came to an end and the voting will begin tomorrow. The Students of the university are super excited as the election is taking place after 28 years. Not only student wings of established political parties, but also a couple of independent student bodies without any political affiliation have fielded candidates. In total 21 candidates are running for VP post and 14 for candidates for GS. This is the highest numbers of candidates vying for the top two posts in the history of DUCSU. All student groups are partaking in the polls. Around 43,000 students are set to cast their votes between 8:00am and 2:00pm on Monday. General students expect that they will be able to exercise their voting right freely and peacefully. Although it has been reported that ruling party backed BCL men are intimidating rival candidates to withdraw their candidacy triggered a sense of fear and anxiety among the voters. Moreover, the university administration imposed restriction on live telecast either by mobile phone or TV camera, and also limited the number of journalists from each media outlet to cover the election. According to a university press release, only two journalists from each print media and four camera units from each electronic media will be allowed to cover the election. Besides, live telecast, online streaming, mobile phones or other electronic devices will be prohibited in the polling centres. Journalists will have to remain at specific points in the voting centres. Many candidates and students have reacted sharply to the idea of media control. They are seeing it as a ‘blue print’ to cover up the possible irregularities of the pro-government student union to win the election. Concerns about a free and fair election are being raised from different quarters, especially because there is no congenial environment on the campus for all student organisations to co-exist and perform their activities. The ruling-party backed student wing seems pulling the string in the election affairs. It is hoped that the university authorities will ensure a level playing field for all law-abiding student unions in the election. Besides, the university authorities must re-establish its authority in residential halls by undercutting the undue influence of ruling party student organisaiton. If residential students are left to the mercy of a particular organisation how they will vote freely? Ensuring peace on the campus is another important pre-requisite. None should be allowed to show their muscle power to force their rival candidates out of the campus or coerce voters or to rig the election. Today’s students, most of whom may have born after the postponement of DUCSU election in 1990, only heard or read past glories of the students’ union. So, they have never seen an election to the body to take place, but they are aware of their rights and protested for long for this election. Now what will they experience – a fair or farcical election – will depend of the efficiency and integrity of DU authorities. The collective eyes of the entire nation are now trained on Dhaka University which is seen by many as the cradle of democracy. So the universities authorities must strive for a free and fair election.